INTERMISSION: "IN LIKE A LION.."
Tomorrow is the first day of March. Three weeks from today is the first day of Spring. Riiiight. we've been so lucky here with hardly any snow at all this winter! You're hogging it all! And three months from today is the start of black fly season. 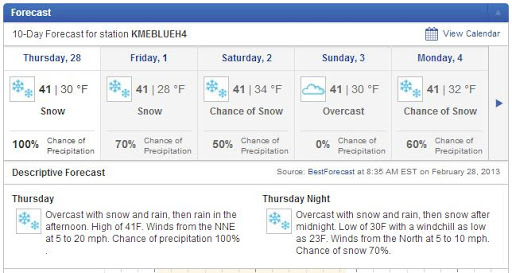 This forecast reminds me of the "springs" I grew up with outside of Syracuse NY. We are most likely going to be buying a place in Maine in the next few years, eventual retirement there for part of the year. People ask us, Would you leave for the winter? I always say no as I love a real winter w/snow – we'd leave for March & April – which were always my least favorite months in NY. Curious what you think of that plan or are we fooling ourselves? But look! It's up to 41 degrees during the day! Sigh, even so, I basically hate March in Maine when even the prettiest areas look dreadful. There are literally thousands of drug rehab centers in California. insures a secure, common soldier, and socially welcome fixing because of our henchman. That can result in a vicious cycle that is never-ending.